The new $2.2 billion Salesforce Transit Center, which was shut down Tuesday evening after work crews found a crack in a steel support beam, will remain closed until at least the end of next week, said a top official with the Transbay Joint Powers Authority. Mark Zabaneh, the agency's executive director, also said at a press conference Wednesday afternoon that inspectors Tuesday night had found a second beam with cracking. "Our inspection last night indicated that the adjacent beam to the beam in question also suffered some cracking," he said. "Not to the same extent as the beam in question, but still had some cracking." Zabaneh said Wednesday that the cause of the cracking at this time was unknown. "It could be a fabrication issue," he said. "It could be a welding issue. It could be an installation issue. It could be a design issue. We're looking at all of them to find out what exactly caused it to crack." He also said the cracking is localized to a particular area in the center, but that inspectors are inspecting the entire complex to ensure there are no other issues. Workers discovered the first crack around 10 a.m. Tuesday while replacing roofing tiles. Zabaneh said engineers spent the day inspecting the damage and decided to shut the station down around 5 p.m., just as the afternoon rush hour started. The first crack was found near a weld on a stress-bearing horizontal beam, Zabaneh said Tuesday. He said he did not know how long the crack was, but he told reporters that American-made steel was used in the construction of the center, which opened Aug. 11. San Francisco Mayor London Breed visited the Transit Center Wednesday and met with Transbay Joint Powers Authority leadership and city department heads about the ongoing investigation into the situation. She said a plan needs to be in place to reopen the center as soon as possible. "The Transbay Transit Center is too important for our city and our regional transportation system not to act quickly to have definitive answers for the public, and someone needs to be held accountable once the cause is determined," Breed wrote in a statement. "As the safety of the people of San Francisco is always of primary importance, we continue to act cautiously and keep the Transit Center and block of Fremont Street closed until we have further answers." Supervisors Jane Kim and Aaron Peskin said that while it was a good move to shut down the transit center, they have serious questions for managers of the structure. Peskin, who is also chairman of the San Francisco County Transportation Authority, said Wednesday morning "you'd think for $2 billion you'd get something that is perfect. Apparently that's not the case." "It's extremely frustrating, particularly given the Millennium Tower situation next door," Peskin said in an interview Wednesday. "This does not create confidence for city officials ... [or] for members of the public." Peskin was referring to an adjacent landmark, the sinking 58-story condominium high-rise Millennium Tower, which has settled about 18 inches since it opened over a former landfill in 2009. "As an elected representative, I am very concerned," said Kim, who represents the district with the transit center. "This is a part of the city that we are building and constructing in heavily and we want to make sure that the structures that we're building, whether it's residential or a transit terminal, are 100 percent safe for our workers and residents. And I will certainly have a lot of questions to ask in terms of what we are doing to ensure that." Commuters expressed frustration about their Wednesday morning commutes. Fremont Street between Howard and Mission streets remained closed, causing major congestion downtown. Buses were diverted back to the temporary Transbay Terminal at Howard and Beale streets, where they had previously arrived and departed as the new transit center was being built. "I was willing to give it a risk today, but I probably won't come in tomorrow," said Anneka Sipes, who took AC Transit's H-line bus from Berkeley, which was 20 minutes late. She was coming to the city from Pinole and said the total trip took two hours. "I'm just really disappointed. I was really excited about the Transbay Terminal ... that it was going to cut down the commute by like five or 10 minutes each trip because it has a direct route right off the freeway." Shronda Allen, who took AC Transit's NX3 bus from Oakland, said the ride usually takes 45 minutes, but today it took twice as long. She said that with the transit center closure and the ongoing Dreamforce conference, which is drawing tens of thousands of attendees to the area downtown, it has not been easy to get around. "I was not prepared for such a long delay. I thought I would get here my normal time," she said. "I'm happy they have an alternative for safety reasons. It's kinda scary that a support beam was cracked. I feel like it's causing a bunch of confusion ... and with the conference going on, getting anywhere in the city, getting in and out, has been terrible all week." Bus lines routed to the previous Transbay Terminal include 27 AC Transit lines, four Muni lines and four Golden Gate Transit lines. 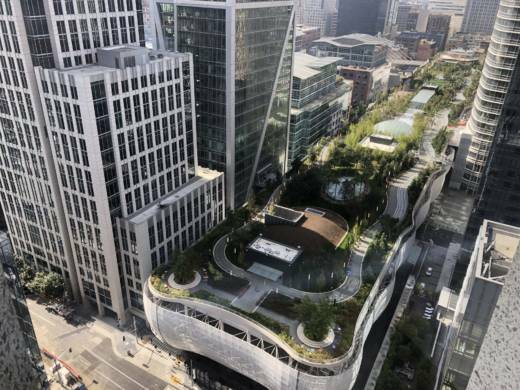 The Salesforce Transit Center, a commanding presence in San Francisco's South of Market neighborhood, is financed by land sales, federal stimulus grants, district fees and taxes, bridge tolls, and federal and state funds. KQED's Ted Goldberg, Anna Kusmer, David Marks, Peter Jon Shuler and Chloe Veltman, and the Associated Press contributed to this post.